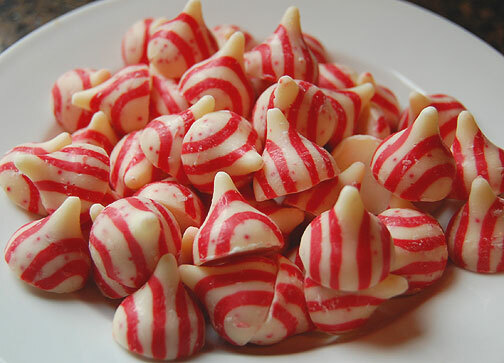 I can’t resist these striped candy cane Hershey’s kisses. 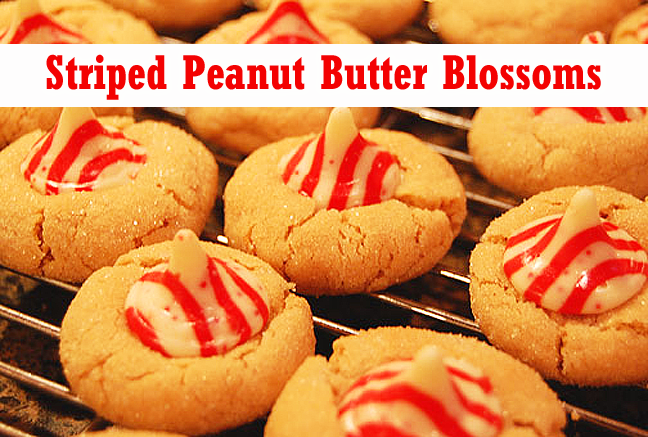 They’re perfect for Christmas-themed peanut butter blossoms. And since we like to eat a lot of cookies around here, we made a double batch and included regular kisses, too — because that’s the kind of cookie monsters we are. 48 Hershey’s hugs, kisses, stripers or several of each! Directions: Heat oven to 375. Remove wrappers from chocolates. Beat shortening and peanut butter in large bowl until well-blended. Add 1/3 cup granulated sugar and brown sugar; beat until fluffy. Add egg, milk and vanilla; beat well. In a separate bowl, stir together flour, baking soda and salt; gradually beat into peanut butter mixture. Immediately press a chocolate kiss into center of each cookie; cookie will crack around edges. Remove from cookie sheet to wire rack. Cool completely. Yield: about 4 dozen cookies.